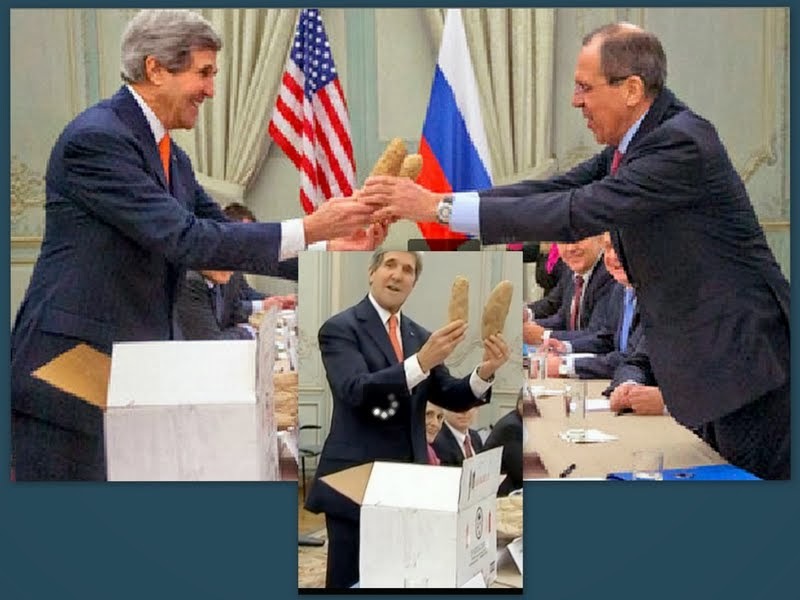 U.S. Secretary of State John Kerry presented Russian Foreign Minister Sergei Lavrov with two potatoes from Idaho before the beginning of their talks at the U.S. ambassador's residence in Paris. Kerry said he and Lavrov had spoken to one another several weeks ago and planned to discuss Syria. 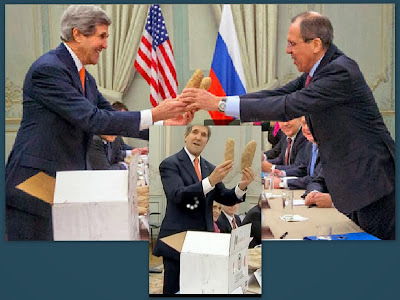 Then the Secretary of State produced two potatoes from a big cardboard box and gave them to the Russian minister. The Russian delegation responded later with an ushanka hat, an iconic relic of the Soviet era, complete with a red star, but colored cartoonish pink. Kerry and Lavrov discussed the possibility of ceasefires in parts of Syria, Kerry said after the talks in Paris. Lavrov said the two also discussed a possible willingness by Syrian President Bashar al-Assad to open aid corridors. "We talked today about the possibility of trying to encourage a ceasefire. Maybe a localized ceasefire in Aleppo," Kerry told the news conference after the talks with Lavrov, which were joined by UN envoy Lakhdar Brahimi a little later. Lavrov said Damascus had indicated it might provide access for humanitarian aid to besieged areas. According to RT, he specifically cited the Damascus suburb of East Ghouta, where fighting traps 160,000 people. "We await similar steps by the opposition," Lavrov said. The United States is pushing for a series of confidence-building measures, including prisoner exchanges, in the Syria war in advance of Geneva-2, a planned peace conference in Switzerland on January 22. Prisoner exchanges may be a simpler goal to achieve. Armed opposition forces are preparing lists of Syrian army soldiers and officials in their captivity, Kerry said. A similar preparation is underway in Damascus. Achieving a total ceasefire would probably be unrealistic under the circumstances, but both the U.S. and Russia are suggesting a localized ceasefire such as in Aleppo, which would serve as a test for the readiness of both sides to curb violence. Syria’s second largest city Aleppo has been a scene of intensive fighting in the past few weeks. A third important step would be providing humanitarian access to Syrian regions most affected by the violence, particularly the Damascus suburbs of Ghouta. Lavrov is negotiating such a move with Damascus, Kerry said. Another important issue discussed by the three negotiators deals with Iran’s participation in the conference. According to Brahimi, an invitation to the Swiss town of Montreux, where the gathering is to take place, has been sent to Tehran. “Iran’s participation or otherwise is not a matter of ideology; it is a matter of common sense,” the envoy said. Kerry said the U.S. supports Iran’s participation in the conference, but insists that Tehran endorses the peace roadmap agreed at the June 2012 Syria peace conference in Geneva. “We hope that in the end the UN Secretary General will invite everyone, who has an impact on the real development of the situation,” Lavrov said.